Why Should I Get a Swimming Pool Inspection? A swimming pool inspection is generally not included in your average home inspection. 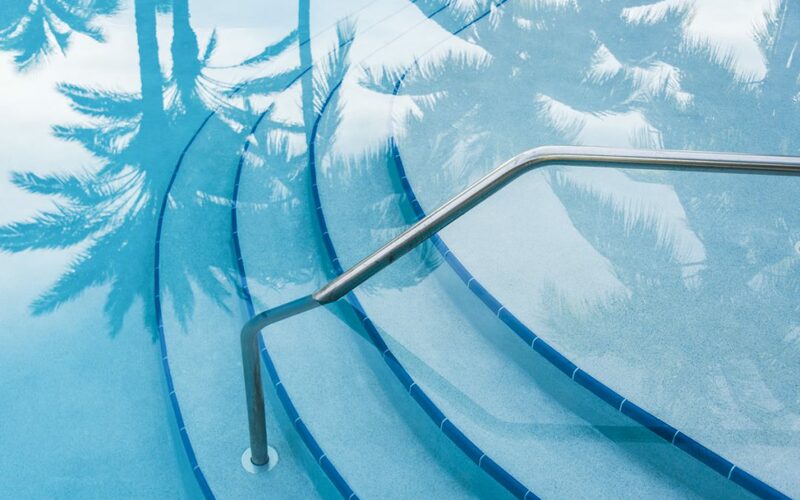 Whether you’re a Realtor®, a potential homebuyer or a seller, it’s important to know what a pool inspection includes and how it could be beneficial to you and the value of your home. 1. A basic report about the condition of the pool (not always in a standard pool format). 2. A current market classification rating and a “Quality of Ownership” score, better known as QScore. A certified pool inspector can give both buyers and sellers peace of mind in regards to the pool’s condition. A certified PoolFax™ pool inspector will check all parts of the swimming pool and provide you with a multi-page comprehensive report on their findings. Filter- There are three types of swimming pool filters: sand, cartridge and D.E. A pool filter is one of the most important parts of a swimming pool, designed to do most of the cleaning and clarifying. Filter circulation pump- The filter circulation pump consists of three components: The motor, impeller, and hair and lint trap. The pump attaches to the filter to provide quiet operation, energy efficiency, improved airflow ventilation and clog prevention. Heater- A pool heater is designed to keep your pool at a warmer temperature. They come in gas, propane, electric and geothermal. Backwash valves- The backwash valve is the valve which is mounted on either the top or side of your filter tank and is specifically used to clean sand filters or D.E. filters. Booster pump- A booster pump supplies high pressure water to a pressure side pool cleaner to optimize the cleaner’s efficiency and performance. Time Clock- This is used as a timer to turn your pool off and on, even when you are away. Chlorine Generator- A chlorine generator produces all the chlorine a pool needs so you don’t have to buy, store or handle it. Visible Plumbing System- A pool’s plumbing system contains many parts such as drains, skimmers, motors and filters. Everything external is thoroughly inspected. Pool Surface- A pool surface is the material that covers the bottom and the sides of the pool. Durability ranges depending on the material used. Deck Drains- A swimming pool deck drain is a drainage system that is installed in the concrete pool deck as a permanent water drain to capture rainwater from the deck, then release it into the yard away from the pool. Coping- Coping is the term used to identify the stone or concrete material used to cap the pool shell wall. Tile- Lining a pool with tiles has long been regarded as the premium finish for swimming pools. These will be inspected for any damage. Pool levels- A pools disinfectant chlorine or bromine levels, and its pH, must fall within certain ranges to prevent pathogens from breeding in the water. Pool Enclosure- The swimming pool enclosure around the pool is checked for safety. This includes the height of the fence, gates, bottom spacing and vertical spacing. Skimmer- A skimmer is meant to preserve a clean pool surface; ridding it of floating twigs, leaves and bugs. Automatic Controls- If applicable, the pool automation system will be thoroughly inspected. Pool Light with Ground Fault Circuit Interrupter (GFCI)- A GFCI is a type of outlet that should always be installed around water. Automatic Cleaning System- This is a system used to automatically clean the pool. They help reduce the need for brushing, skimming and vacuuming. Fill Line- A fill line will make up for evaporation and loss of water through splashing. However, the level of backflow protection may not always be consistent. Visible Water Condition- We will look for any cloudiness or algae growth. Slide- If applicable, we will inspect the slide to ensure safety. Waterfall / Fountain– If applicable, we will inspect the waterfall or fountain to ensure it’s working properly and efficiently. Diving Board- If applicable, we’ll give the diving board a thorough inspection to make sure it was installed correctly. Ladder or Grab Rail- We will inspect the ladder or grab rail to ensure it’s in working condition. Visible Signs of Leaks in Circulation System- The main parts of the pool circulation system include the pump, filter, and skimmers, drains, and returns. If there’s a leak, they won’t perform to their full capacity. With a “Quality of Ownership” score and a PF Classification rating, you will feel certain that the pool you’re purchasing is a good investment. “Quality of Ownership” score, or QScore, is an algorithm that results in a score for in-ground pools based on its fundamental characteristics and PF Classification rating. The score assumes that equipment and materials were installed and operated/maintained per manufacturer standards. The QScore starts at 0 and has a defined minimum, maximum and average within each PF Classification. The PF Classification is a standardized scale for in-ground pools that uses critical components and technological features to categorize swimming pools for real estate valuation. The PF Classification scale ranges from 0-5. PF Classification is not representative of the current condition or quality of installation. The current condition or quality of installation would be identified through a PoolFax™ Certified Inspection, or independent pool inspection service. If you’re a realtor or building professional selling a home, a PoolFax™ report will help you communicate the value of the pool and the property to your client. A PoolFax™ report will provide the best service for buyers and save you and the home buyer any problems in the future. If you’re buying a home, a pool inspection will give you peace of mind in regards to the safety and status of the pool at the home you’re interested in purchasing. Understanding value and recommendations will assist you in offering the appropriate purchase price. Loan officers need to protect their decision, their loan and their customer by ensuring they have the best pool facts for the best decisions and outcomes. Lenders don’t want to finance unsafe properties. A pool that is dangerous or a breeding ground for bacteria is a hazard to the health of the occupants. PoolFax™ Certified Inspectors have experience with all types of pools, equipment and features to deliver a customized, detailed PoolFax™ report. Whether you’re a realtor, a homebuyer or a loan officer, a pool inspection will prove to be beneficial when it comes to real estate valuation and quality of ownership. Today, homeowners must approach the selling of their home with a swimming pool more prepared and aware in order to retain full market value. Without proper awareness of where their pool stands in comparison to today’s “quality of ownership” features and advancements, a seller will be vulnerable to the most common point of buyer leverage for low contract offers. PoolFax™ Certified Inspectors have experience with assessing in-ground swimming pools from the perspective of “quality of ownership” so that fair pricing concessions and market value can be supported. Whether you’re a Realtor®, a homebuyer or a homeowner, a pool inspection will prove to be beneficial when it comes to real estate valuation and quality of ownership.